Good afternoon everyone! I hope you are all having a lovely weekend! We are having some extremely hot weather which works out great for me because that means I can hang out in my office enjoying some AC and get caught up on the #52weeknailchallenge2018!!! The challenge I am sharing today was the emerald challenge, something for those May babies to celebrate. I tend to avoid darker shades this time of year but with a holographic emerald lacquer, I was still having strong summer vibes. 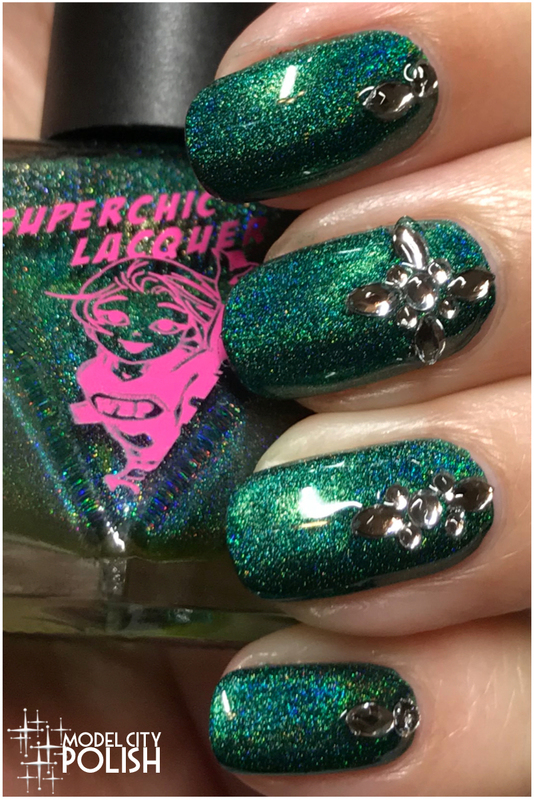 For my emerald nails I started off with two coats of No Rest For The Wicked by SuperChic Lacquer, quiet possible the prettiest emerald green holo on the market. I wanted to add more of gem feel so I decided to the Twilight Twinkle decals from Cina Nail Creations. These were super easy to apply compared to hand placed rhinestones and lasted a whole week for me! Everything was sealed with two coats of Marvel Liquid Macro Top Coat by SuperChic Lacquer. So what do you guys think of my emerald look? Man do I love my SuperChic Lacquers!!! 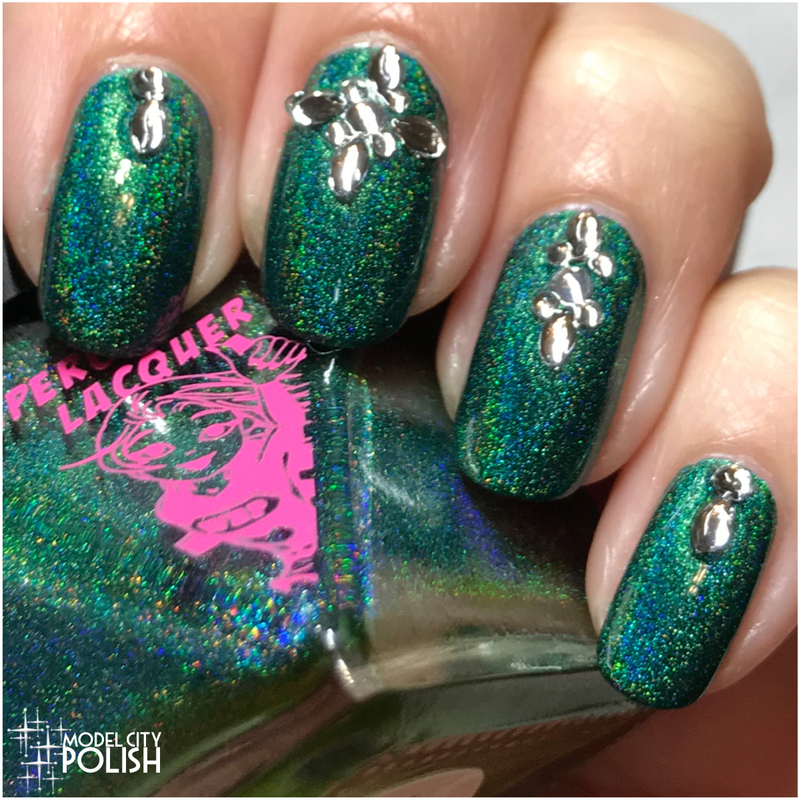 Their vibrant holos are perfect in every way and stamp beautifully too! Thank you so much for stopping by today and I will see you all again soon! The emerald design looks solid! Very well made and the color is great too! Your nails are so bright and colorful! I love the extra detail with the crystal embellishments too. Perfect for a night on the town! I love glittery nail polish! This green color is amazing! This is a perfect emerald color! Love the sparkle! I usually only do my toes as my fingernails comes off too quickly with all the gardening etc that I do. lol! The color is so pretty. I want to try the color one day. Thanks for sharing. I seldom put nail polish but I am diggin’ the color! It’s so shimmery and glittery! Well done girl !! This is so pretty !! You did a great job and i love the color ! Oh my, I LOVE the color, and the design is really pretty! What an awesome artwork! Oh my, this is fabulous!!! Absolutely perfect for a colourful summer outfit. The Lacquers are superchic indeed. Really love this colour, it’s stunning! I love the sparkly combo! It adds that extra pizzazz that I just adore. What a great color on you. Emerald is my gem and diamonds are one of my bestie:) I would wear this color year round. It is gorgeous. 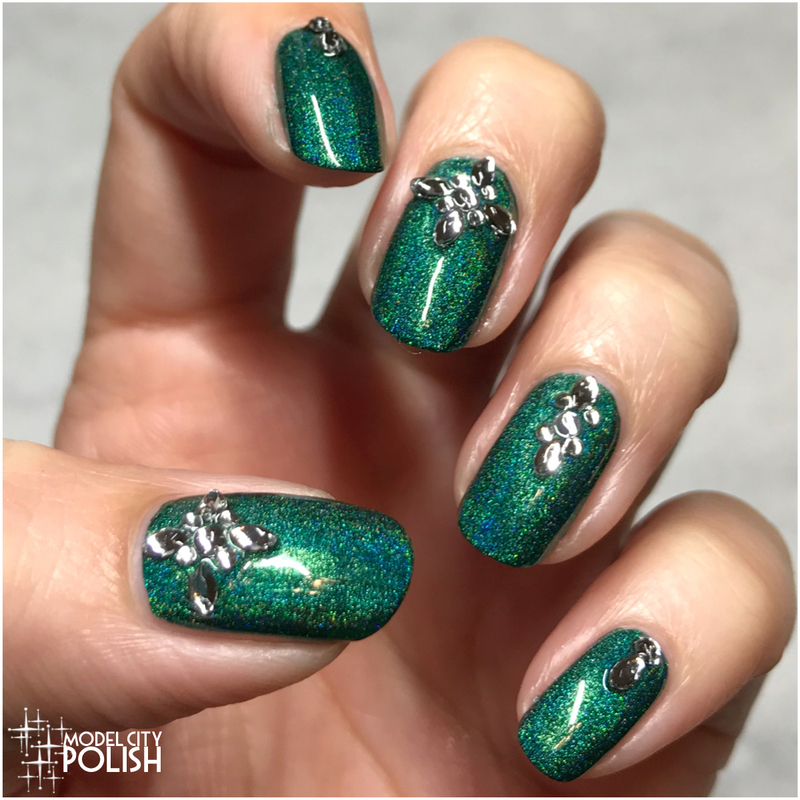 I love the green, glittery color of the polish! How do you get your nails to look so professionally done? I really love this color and love the accents you chose! Great job! I love your nail art emerald green with diamond glitters. With such nail art you do need much accessories. oo, these are super fun and pretty! Wow fabulous! Unfortunately though it’s something I could only appreciate looking at other women. My fingernails would look like tiny M &M’s. That color is so gorgeous! I love the diamonds and the sparkle it makes it perfect and fun for summer.